We are not youth any longer. We don't want to take the world by storm. We are fleeing. We fly from ourselves. From our life. We were eighteen and had begun to love life and the world; and we had to shoot it to pieces. The first bomb, the first explosion, burst in our hearts. We are cut off from activity, from striving, from progress. We believe in such things no longer, we believe in the war. 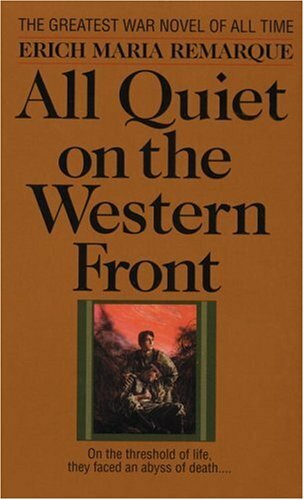 All Quiet on the Western Front is a book that had a profound effect on me when I was younger. I read it in high school and I remember it was the first book that made clear to me that wars often do not have a "good side" and a "bad side." There are no sides, really. There are just people, who in any other situation, might get along quite well and be friends, but because of some decision they did not make, they are instead on opposite sides of a field trying to kill each other. It may seem naive or silly that I was well into my teens before I truly understood that, but it's true. Perhaps it's also because I knew WWII much better than WWI that I had a vague sense that Germany was at fault for everything. Remarque's book made it clear to me that was not the case. In my opinion, this book doesn't have a plot. It is very episodic in nature, following Paul Baumer through his experiences in the trenches of France during World War I. We feel his terror when he's on the front line, his strong camaraderie with his squad, his inability to connect with his family and his hatred of an establishment that allows a few powerful men send millions of young boys to their deaths for a cause they don't believe in. This book didn't have the same shattering effect on me this time around as it did the first time. I don't see how it could; you can't lose your idealism twice. This time, the writing style didn't wow me as much, either. Prior to this re-read, I would unquestionably tell people that this was one of the best books I've ever read. If this had been my first read-through, I don't think I'd have the same reaction. But when a book has such a profound effect on you, how can it not be one of the best books you've ever read, even if its effect is lessened on a re-read? Does a book have to be earth-shaking each time you read it for its "wow factor" to be valid? I don't think so. I think it just needs to change you once. And All Quiet on the Western Front did that for me. I no longer think of the "right side" or the "wrong side" of a war. I think of the winning and losing sides. I think of how each side thinks it's fighting for its culture and its rights and things of importance. Of how each soldier misses his family and friends and worries about death, and how much they truly give up to fight in a war. It's not just that they risk their lives. They risk the possibility of coming home and not fitting in. Of being unable to forget what they went through. Of losing their greatest friends, and of no longer having faith in their elders or their country. It's a lot to ask for- a lot to demand of someone. And this book makes clear how much a sacrifice it is. So even if this time, I didn't sob for the wretchedness of the world, I did feel a profound sadness at an entire generation that was forced to grow up too quickly and in such horrifying circumstances. More than any other book I've ever read, Remarque's novel showed me just how depressingly pointless war is, and how wasteful. 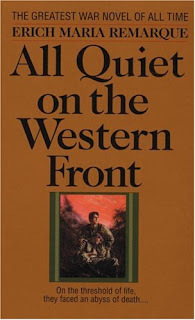 For that reason, I will always recommend a person to read All Quiet on the Western Front because it is a great war novel. It does not glorify war, it reviles it. It grabs you by the shoulders and shakes you, hard, desperate for you to realize how miserable battle can be. Because no matter how much we say "Lest we forget" or "We shall always remember," we always do forget and choose not to remember. And when we do that, we lose the enthusiasm and idealism of our younger years. I want that quiet rapture again. I want to feel the same powerful, nameless urge that I used to feel when I turned to my books. The breath of desire that then arose from the coloured backs of the books, shall fill me again, melt the heavy, dead lump of lead that lies somewhere in me and waken again the impatience of the future, the quick joy in the world of thought, it shall bring back again the lost eagerness of my youth. I sit and wait. Every once in a while I read a review and think, "wow, I wish I had written that!" And this review is definitely one of those! What a truly wonderful passage in your review: "This book didn't have the same shattering effect on me this time around as it did the first time. I don't see how it could; you can't lose your idealism twice." This applies to so many rereads for me, but I never could have articulated it quite so well. And I loved this bit too: "So even if this time, I didn't sob for the wretchedness of the world, I did feel a profound sadness at an entire generation that was forced to grow up too quickly and in such horrifying circumstances." You put it all so well. We can't go home again. Admirable job, Aarti! I tried this once, but I really should again. I gave up too easy and you knwo me and translations, ok it is not like I would read it in its original form but perhaps English would be better. I have never read this. There is something about the title that always put me off. I think I associated it with a wartime book that glorifies the war, I'm not sure how that happened. I think your review convinced me that I really need to read this book. If only to find out what its effects on me are. Having taught a humanities class for about 8 years I have read this book (or parts of it) many times. I like it, but don't love it. However, It's one of the books that students actually like when they are "forced" to read it for English class. WWI is one of my favorite times in history so that helps. I have to admit this book has always scared me to pieces. Maybe it's just the cover - it makes the book seem so dry! I need to get past that prejudice. So true about there not being a 'right' and 'wrong' side. I've always been scared of picking this up as well, I'll have to try it eventually though, you make it sound great. Blodeuedd- I can see why you didn't like it. It CAN be tough going, but personally, I think it is worth it. I don't know Siegfried Sassoon- I will look into him! Iris- It definitely does NOT glorify war at all, I promise! Helen- WWI is absolutely fascinating, I agree. Thank you for your recommendations! Amanda- It does look dry, and in parts it is. But it's also so moving, I think it is worth the effort. Amy- Yes, I hope you do pick it up! Much to my chagrin, this is a book I have not ever read. Your review was beautiful and makes me think that this is one that I really need to read very soon. I don't often contemplate war, but when I do, I sometimes find myself thinking in terms of "good guys" and "bad guys" and I think that this book would really disabuse me of this notion and give me a more accurate feeling about the grey areas that all wars are composed of. This is a book that I am going to read soon, even if I have to work really hard to squeeze it in, because not only do I think the story is very timely in the world we live in, but also because it's a message that I really need to hear. What a great review! It's gotten me thinking about books that have triggered paradigm shifts in my own thinking. Most often it's major changes in how I think about writing and narrative, rather than how I think about The World. When that's the case, there's a residual thrill in going back to them and reveling in the thing they do that I'd never thought of doing before. The one book I would say brought on major changes in my life was Julian of Norwich's Revelations of Divine Love, and now that I'm thinking of it, I haven't reread it since that first time. I'm curious now to see what I would think on rereading it. I first read it as an Illustrated Classic when I was around 12 I guess. Book was too sad for me at that time. War and everything depicted though was made suitable for kids reading it made me depressed. When I next read it for college in it's true unabridged form I realised how much wasn't told in the illustrated version. I left me as you said 'numb'. It took me a whole week to write the report because I hadn't read much war lit before this book and it shocked me quite remarkably. Zibilee- I am absolutely the same way. I am glad I read this book again now, to reinforce the idea that there aren't really "good" or "bad" sides. Greg- Yay! I actually noticed at the store that Remarque has a LOT of other books, and apparently, they are all very good! Jenny- That's actually a really good point! Some books make me appreciate the art of writing (and reading) more, and some really kind of shake me emotionally. I love the term "residual thrill." Shweta- An illustrated classic?! Really? That sounds... really bizarre! I'm almost embarrassed to say I've always thought this was a western...because I confuse it with "How the West Was Won"...because I always used to shelve both of those movies when I worked at the library. I really would like to re-read this one as well. I read it when I was 15 or 16 and would probably see a whole new side of the book, especially in light of the war we've been engaged in for the last 9 years. I must admit that I don't like to read books on war. I don't know why, but I just don't enjoy them. Anyway, thanks for your review! "But when a book has such a profound effect on you, how can it not be one of the best books you've ever read, even if its effect is lessened on a re-read? Does a book have to be earth-shaking each time you read it for its "wow factor" to be valid? I don't think so." I think there are probably quite a few books that would be in this same situation if I were to re-read them. Nevil Shute's On the Beach for instance was one of the first post-apocalyptic books I read and I totally became absorbed in it as a teenager. I'm not sure it would impact me the same way today. Kari- I won't even get into my embarrassing book facts ;-) Not shameful at all! Bookshelf Monstrosity- Yes, I think that's what made me want to pick it up, too. Andreea- Aww, that's too bad. I don't read many war books, either. Christy- Yes, that's exactly what I mean! I'm glad that came through and that you know the feeling I meant. I had a similar experience with this book in college. Your review and the excerpts remind me how simply gorgeous it is as a chronicle of experience, even aside from the message. Thank you, Aarti. I completely agree that a book only needs to be earthshaking once for it to be an amazing book. I haven't read this one since high school, but maybe I'll read it again! I wish I had read this one when I was in high school. I'm quite sure it would have affected me more than it did when I read it for the first time in my forties. But it still really made me think and having my son (who is a teenager) read it for the first time and share his thoughts on it with me, really made me feel less jaded and cynical. I read this in high school, too, and all I remember is the end. Over 20 years later, and I still can't get that image out of my head. Rebecca- I don't think I'd have come up with an example, either, if I hadn't just read this one. Swapna- Yes, that is the last time I read it, too- it was worth a reread for sure! Kathleen- Yes, I think some books are really powerful when you read them as an adolescent. When you're older, they can still affect you, but I feel that is when you are probably at your most vulnerable and idealistic. softdrink- I KNOW. So powerful. I read this one when I was in high school and admit I remember so little about it. This is one I should re-visit, I think. Thank you for reminding me about this book. Wow! Love your review! I have to look this one up, but I have heard of it before. Not sure where though. Thanks for reviewing it! Though I'm already too old for this to have the impact on me it did on you the first time, I still really want to read it. First because I've never read anything on WW1 from the German side, and secondly because a book that shows the complexity of war so powerfully is certainly a book I want to read. Literary Feline- I was the same way! I had forgotten huge chunks of it, but still remembered its impact. bookmagic- I often wonder if we get enough out of books when we read them in school. I am glad the Flashback Challenge lets me go back and read these. Aths- You're welcome! I hope you enjoy it, if you try it. Nymeth- I think you might really enjoy it because of the way you have focused on war's impact on the homefront and on women. Obviously that's important, but it might be really interesting for you to view it from the side of a man actually in combat as well. I read this at school and watched the movie too. It's one of the texts we were set for history and it really hit home how awful and destructive war was for everyone, like you said, the winners and the losers. Wonderful, honest review, Aarti! this is a reaaly good book but i agree with you about the second read-through not being as "wow-ing"
I finished All Quiet for the first time just this past weekend. I related to your initial reading, but also your experience the second time. Indeed, you cannot lose your idealism twice. Thanks for your thoughtful review! This is the best book I have every read and I wish that everyone could get a chance to read it sometime in their lives.